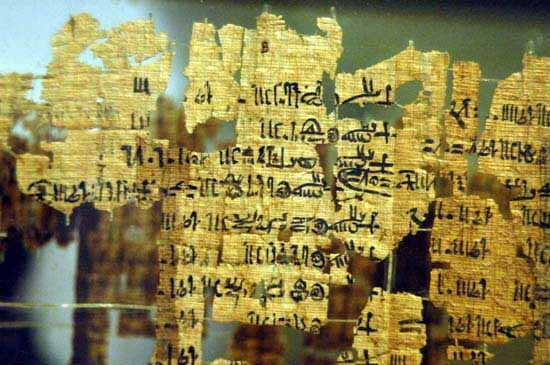 The Turin Papyrus, also known as the Turin King List, or, the Turin Royal Canon, is a hieratic papyrus thought to date from the reign of Ramesses II (c. 1200 BC), now in the Egyptian Museum in Turin. It is the most extensive list of kings known and is the basis for most of the Egyptian chronology before Ramesses II. The Turin Papyrus, also known as the Turin King List, or, the Turin Royal Canon, is a hieratic papyrus thought to date from the reign of Ramesses II (c. 1200 BC), now in the Egyptian Museum in Turin. Unlike the other king lists, the Turin Papyrus includes foreign kings that ruled Egypt and lists the names of the rulers, the lengths of reigns in years, months, and days for each individual king. It also includes the names of ephemeral rulers and those ruling over small territories that may be unmentioned in other sources. The papyrus was found by the Italian traveler Bernardino Drovetti in 1820 at Luxor, Egypt. Sadly, when it was unpacked in Italy, the list had disintegrated into small fragments, most of the list ruined forever. The Turin Papyrus contain eleven columns and is also divided into ten sections, or dynasties (A-J) if you will, with summations and headings intersecting the list of kings. These dynasties does not synchronize well with Manetho – neither the number of kings, nor number of dynasties. Just have a look in the table below.